I've been doing this project for almost a year now, and I've listened to a lot of interesting music. But thus far I've skirted around one of the biggest forces in popular music today - rap. Except for a brief dalliance with OutKast last summer, my rap listening has been entirely music that is decades old - Public Enemy, A Tribe Called Quest, and Run-D.M.C. I don't know why I've been avoiding rap music. It's not a question of taste - what rap I've been exposed to I've found intriguing. But there's something very intimidating to me about the entire field of hip hop, even more so than most popular music I know nothing about. My parents exposed me to classic rock, and the white-boy indie music that's churned out today is not terribly far from my nerdy academic sensibilities. But I can't shake the feeling that I'm not the targeted audience for rap music, and there's something about that that makes me feel like a poser merely for listening. On Friday night, as I kicked back in my khaki shorts with a glass of wine and a crossword puzzle, I couldn't help but notice that the Roots CD I had put on didn't really fit the rest of the scene. I kept waiting for the Cool Police to come in and tell me to turn that music off and put back on a violin concerto or Vampire Weekend or something. In my mind's eye, the Cool Police always look like my black neighbors, who I'm certain are judging me through the walls when I listen to this. This is all ridiculous, of course. If you haven't heard, we're living in a post-racial world now, and hip-hop is arguably the most influential and prominent genre in popular music today. The counter-cultural icons of yesteryear are now thoroughly mainstream (Exhibit A: Last night's Superbowl half-time show), and I'd argue that rap artists, from their politically-charged lyrics to their crazy celebrity antics, are the true musical superstars of today. Which means I should probably buckle down and start listening to more rap and stop worrying if that slightly tan looking dude is judging me for listening when I have my window rolled down at a stop light. But it's a different kind of music, and as a result I found it hard to do this week's write-up. Rap music has its place in the history and present culture of popular music, but it also has its own traditions and rules which I'm hardly familiar with. (What's with the skits? The nicknames? Why does every other track have a guest vocalist?). I'm also not as familiar with even the basic terminology, so I hope you'll forgive me as I try and wade through this. I'm going to try and make an effort to put more rap artists on my listening list, and hopefully I'll learn enough during the process to not embarrass myself when I talk about it. If I approach something entirely the wrong way, don't be afraid to berate me in the comments. But just keep in mind that I'm a skinny white kid with a Beethoven bumper sticker on his car that's trying his best. WHAT I KNEW BEFORE: Really, I was only familiar with the Roots because they're currently the house band on the subpar Late Night with Jimmy Fallon (in fact, they're probably the only consistently good aspect of that show). I was intrigued enough by their all-over-the-place style of jamming to choose to listen to them for a week; as it turns out, their recorded material is somewhat different in tone, the most notable distinction being the lack of a full-time sousaphone player (seriously). MY LISTENING: I listened to Things Falls Apart (1999) every day this week, and to Phrenology (2002) three times, as these seemed to be the two most highly-acclaimed Roots albums. I also listened to Game Theory (2006) and Rising Down (2008), as those were the other two Roots albums that happened to be available at my local library. Like I said, most of what I can compare the Roots' music to is older rap from the 80s and early 90s. And, in that regard, their music is lot denser than old-school hip-hop. Gone is the single rapper laying lyrics atop a single tape sample; rather, the Roots' tracks are intricately layered and deep, in the sense that it feels there's a lot of textural levels of the music to explore. 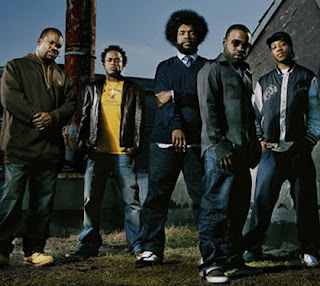 Part of the Roots' claim to fame is that they use few recordings during their live performances, rather playing all the backing beats themselves. This sort of performance certainly shows through on their CDs, as the tracks are filled with complex drum parts, backing vocals, squealing guitars and electrifying keyboard parts. It could have ended up sounding flashy and overproduced, all glitz and no substance, but I think the "live performance" aesthetic helps to ground these songs. That most of these tracks wind their way through funk, soul and other disparate genre influences only makes it that much more interesting. The Roots are also deep in another sense - their lyrics tackle serious subjects like domestic violence, while name-dropping prominent black figures like Chinua Achebe and W.E.B. DuBois. I wasn't expecting the music from a second-rate late night show's house band to tackle such subjects, so I was surprised to discover that a lot of the Roots' music is grounded in this political and social activism. It wasn't exactly what I was expecting and so it took a few days for me to get on board with this sort of music, but by Thursday I was admiring the well-crafted, very intelligent lyrics. "Inevitably, hip-hop records are treated as though they are disposable," implores a voice in "Act Won", the opening to Things Fall Apart. "They are not maximized as product, not to mention as art." The Roots, at least, seem to be trying to change this. I don't think I listened to a single Roots album this week that was less than an hour long. It seems like with each CD they're trying to outdo themselves, cramming everything they possible can onto the disc. To call it "overambitious" would be an understatement; every album is another attempt to make the definitive alternative hip hop masterpiece, and I'm not sure if they ever really succeed. I'm all for incorporating a variety of influences into your music, but the endless sound collages and spoken poetry went a little too far for me. A few times, like "The Return to Innocence Lost" at the end of Things Falls Apart, and the epic "Water" on Phrenology, degenerate into what amounts to a bunch of sounds cobbled together to drift aimlessly for ten minutes at a time. I much preferred the Roots when they concentrated their efforts on shorter, less artsy tracks. WHAT I LEARNED: I usually do my listening while working on schoolwork or cooking dinner, but I'm not sure if rap music is best suited for those endeavors. The Roots especially were a different kind of music, more emotionally draining and in-your-face, harder music to multitask to. I was able to appreciate the music more while driving, or going on a walk, when there was nothing else to distract me. Whether this is a phenomenon that applies to all hip hop, or just the Roots, remains to be seen. FURTHER EXPLORATION WOULD ENTAIL: I really have no idea where to begin. Wikipedia tells me that Roots frontman ?uestlove headed a "neo soul and hip-hop informed musical collective" called the Soulquarians around the beginning of the century, with other musicians like Mos Def and Q-Tip (who I've at least heard of), and Talib Kwali (who I actually saw perform once). I suppose this would be a place to start? Perhaps? BEST SONG YOU'VE HEARD: "The Seed 2.0"
For the second week in a row, the default choice, as it's possibly the only song you've heard. BEST SONG YOU HAVEN'T HEARD: "The Spark"